City officials held another public meeting on the proposed jail at 80 Centre Street, and again the shouts of protesters drowned them out. The boisterous gathering, a hearing on the draft scope of an environmental review of the project, seemed destined to end before it could begin. Held on the second floor of the Municipal Building last Thursday evening, Sept. 27, the room had reached its 230-person capacity while a line remained outside. Chants of “Let them in! Let them in!” prevented representatives from the Mayor’s Office of Criminal Justice and the Office of Environmental Review from speaking. After huddling over how to proceed—and the arrival of building security officers—they chose to go through the motions of describing the project and the process in prepared statements. Beneath new chants of “Let us speak!” and “No new jails!” they could not be heard. Soon the mic was turned over to a long list of speakers, many calling on the city to scrap its plan. The raucous reception was largely a repeat of a town hall held on Sept. 12, when officials tried to explain the city’s proposal to convert 80 Centre Street, a city-owned building that straddles the Civic Center and Chinatown, into a high-rise detention center. The plan is part of the de Blasio administration’s initiative to close Rikers Island and replace it with a jail in each borough except Staten Island. 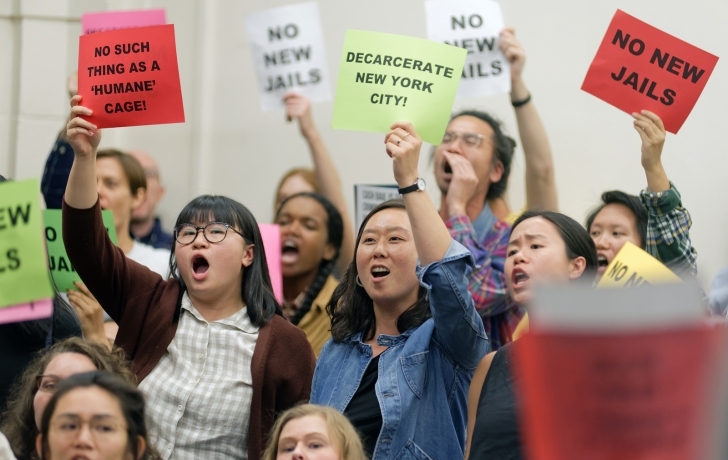 A group of protesters at the scoping meeting, part of the #nonewjailsnyc campaign that advocates reforms they say would eliminate the need for Rikers Island and any new jails, were a new addition to the cacophony of opposition voices. Their call for closing Rikers Island seemed to mute those from previous meetings who had argued for upgrading the current facility. People who spoke complained that the area to be studied for the jail’s impact was too small. They questioned the consequences of years of construction on local residents, businesses and traffic. They argued against the current plan for a single environmental study or U.L.U.R. P. (Uniform Land Use Review Procedure) for all four proposed jail sites, rather than individual reviews. And they feared the shadow that will be cast on Columbus Park from a jail tower that might rise as high as 432 feet. “To build a 40-story tower that’s going to take away sunlight from young children and babies, sunlight for our elders who use the park every morning, you take away the community, you take away the neighborhood,” said the mother of a 22-month-old who visits the park daily. Added to the many comments from residents, Community Boards 1 and 3 and elected officials submitted a dizzying list of potential impacts they wanted to see studied in the environmental review. Repeatedly, people decried a process they said had kept the public in the dark over the city’s sole choice of 80 Centre Street. In February, the city had announced that the Manhattan Detention Center at 125 White St. would be expanded for the new jail. “By not including us in this decision, you’re basically dissing everyone,” said Thomas Eng, president of Chatham Green. In response to a question from the Trib about the choice of 80 Centre Street over 125 White Street, Patrick Gallahue, a spokesman for the Mayor’s Office of Criminal Justice, wrote in an email that “it offered a better footprint, more community benefits, since we could return the North Tower of 125 White St. to the neighborhood, and move the jail closer to the justice hub of courts and other government buildings.” Gallahue did not respond to the question of why the public had been excluded from the decision process. Following are the questions that Chin asked in her letter, and the answers she received from Dana Kaplan of the Mayor’s Office of Criminal Justice. What was the process of selecting 80 Centre Street as the location to scope for this project? The Administration considered both 125 White Street and 80 Centre Street as locations for the replacement detention facility for the Manhattan Detention Center. Both buildings are city-owned and adjacent to the courthouse. While the Administration solicited feedback on both options as possible replacement facilities, 80 Centre Street was selected by the Administration because it was closer to the civic core and comparably scaled buildings; the 125 White Street location would have been a taller building, and 80 Centre Street opened up a community development opportunity for the neighborhood. What were the results of the analysis of alternative sites/locations considered for Manhattan’s Borough-based jail, and why did the Administration deem those sites not feasible? The land area of the facility at 125 White Street did not have adequate space for our programming goals. A proposed jail on that site would have been taller, and would have been closer to the residential areas of Chinatown. 80 Centre Street is closer to the civic center of Downtown Manhattan and is closer to the taller buildings of that area, and also opens up the opportunity to return the North Building of 125 White Street to the community for development into another community need such as housing. How did the Administration determine that 125 parking spots would be included at the 80 Centre Street site without information about number of detainees, or necessary Corrections staff? The current plan is [to] provide for 125 spots on site. This was determined based on the size of the site and the geotechnical conditions that limit our ability to build below grade parking. We are currently working with estimated staff and visitor needs to evaluate the extent to which these spots are sufficient. The result of that analysis will be provided for public review and comment as part of the Environmental Review process. Given that State action will be required for criminal justice reform, specifically regarding bail reform, how can the City commit to a decrease of detainees to the targeted number of 5,000? If not, what is your plan to work with the Governor and State Legislature to enact these needed changes? The City can achieve a 5,000 person average jail population without the State cooperation and/or changing existing laws. However, State criminal justice reform—particularly bail and parole reform—would allow the City to reduce the jail population to a 5,000 person ADP faster. Based on our data projections, along with a 25+ year trend of reducing the jail population, we are confident that through strategically reducing crime, shortening case length, and offering safe alternatives to detention (along with other initiatives), the City can continue to reduce the population to our stated goal. Lastly, the City is working with the State to pass comprehensive criminal justice reforms. What is the back-up plan if the City cannot reduce the number of detainees to targeted levels by the time needed? The City’s crime and jail projections indicate that reaching a 5,000 person average daily population is feasible—even without state cooperation and/or legislative changes. The City has achieved more than 25 years of declining crime and jail population reduction. Since the Mayor took office, the jail population has fallen by 27%. The City is working tirelessly to achieve this goal through expanded pretrial release programs, alternatives to incarceration programs, and various crime prevention programs like the Mayor’s Action Plan for Neighborhood Safety and the Office to Prevent Gun Violence. Why was there no mention of impacts that a relocated MDC would have on the community, or any mention of a plan to mitigate those impacts, in the Administration’s presentation at the Sept. 12 Town Hall? The Draft Environmental Impact Statement will include analyses of the potential for the proposed project to result in impacts within study areas up to 1⁄2-mile surrounding the 80 Centre Street site. In accordance with City Environmental Quality Review (CEQR) guidelines, the analyses, any potential impacts, and mitigation for those potential impacts will be underway after the scoping meetings and will be publicly available within the following months. For example, nearby Worth Street is currently under a massive, multi-year reconstruction that is already three years behind schedule. How is redevelopment on 80 Centre Street going to be coordinated with this ongoing project? We estimate that the overall Worth Street project will be done in spring 2021. We expect work near 80 Centre Street to be done in spring 2020. As for the work at the 80 Centre Street site, if passed, we don’t anticipate coordination issues across the two projects but would work with all stakeholders to minimize construction impacts in the area. Given that placards for official vehicles already take up numerous parking spaces in Chinatown and elsewhere in Lower Manhattan, what is the Administration’s plan to accommodate the increased parking needs for staff and visitors of an expanded MDC? There will be on-site parking for use by staff and service providers and the City will continue to look into this issue.